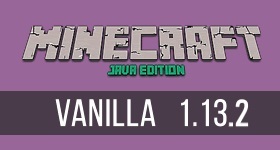 Minecraft Java Edition 1.13 Update Aquatic! Featuring dozens of new features, creatures and adventures! It’s finally arrived! Minecraft 1.13.2 brings some of the largest and most exciting changes to the base game since 2014 and hosting it on your Minecraft server couldn’t be easier. The world is your oyster and the oceans are the pearl. Swim with the dolphins, breed sea turtles, collect tropical fish, harvest sea-life and take advantage of some exciting new mechanics. If that isn’t enough for you, then don’t forget to check the depths for shipwrecks and buried treasures. But look out for the Drowned, these underwater undead are not to be taken lightly. If you can defeat them, you may earn yourself a Trident. These new weapons can be enchanted to return after you throw them, help you swim faster and even let you soar through the rainy skies and call thunder down on foes during storms. The largest overhaul to the “vanilla” Minecraft game in years. New monsters and friendly animals to meet, defeat and tame. New blocks and items for building amazing constructs. An entirely new ocean-based world type. Why play Minecraft 1.13.2 on a server? Let’s be honest with each other, Minecraft is always more fun with friends! This update adds so much to the experience you will want to explore and discover it all together. Share your underwater adventures, take advantage of new mechanics with machines and contraptions that make life easy and, of course, become master of the seas with amazing Trident powers. Start a free trial of Minecraft Vanilla 1.13.2 right now for 24 hours. Order today and explore an amazing new world with your friends!